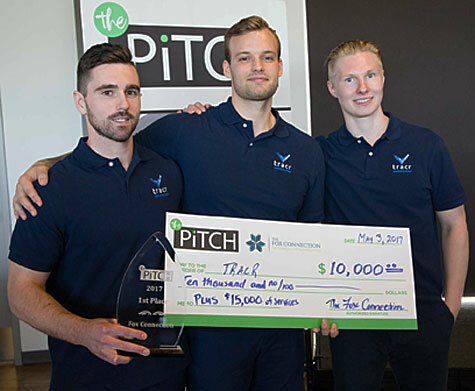 For the second year in a row, a team of Lawrence University budding entrepreneurs wowed the judges to earn first-place honors in the second annual northeast Wisconsin The Pitch competition held April 11 at Fox Cities Stadium. 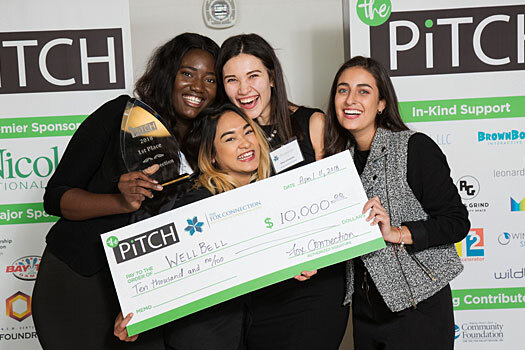 While a trio of Lawrence hockey players won the inaugural Pitch event in 2017, it was the ladies turn to shine in the spotlight this time. A team of four international students — Ayomide Akinyosoye, Lagos, Nigeria, Alejandra Alarcon, Quito, Ecuador, Nikki Payne, Bangkok, Thailand, and Alfiza Urmanova, Arsk, Russia — overcame a technological hiccup to win the first-place prize of $10,000 in cash and $15,000 in in-kind professional startup assistance. Despite a computer glitch that prevented their visuals from being shown during their presentation, the four junior economics majors didn’t miss a beat in confidently touting the importance and benefits of their idea, WellBell, an innovative wristband device with an S.O.S button that can be used to send notifications for help or medical assistance. The team sees potential markets for WellBell in health areas as well for social emergencies, such as sexual assaults or shootings. “I just knew we were going to win,” said an ebullient Alarcon. Payne was a bit less confident, but equally happy. Urmanova is credited with conceiving the idea for WellBell this past January. She says the next step is to create a prototype. 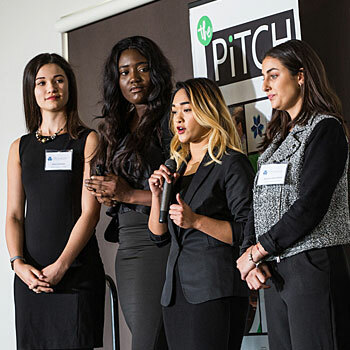 Modeled after the television show “Shark Tank,” The Pitch featured 10 teams of student entrepreneurs presenting their business idea to a panel of judges and a room full of business leaders and mentors. Each presenter is given five minutes to pitch their product or idea and then answer questions from the judges. 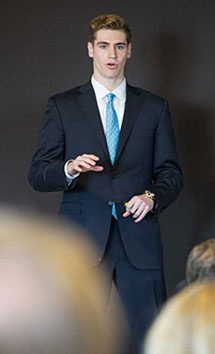 The competition featured two teams each from St. Norbert and Ripon colleges, UW-Green Bay and UW-Oshkosh as well as Lawrence, the only competing institution without a business program. Vaughan says Lawrence’s success in the first two Pitch events transcends just the university’s innovation and entrepreneurship program. “It’s not just the program, but the whole university and how we prepare our young people, how they present themselves, the confidence they show on stage,” said Vaughan. As for the prospects of WellBell, Vaughan thinks it has a future. Akinyosoye says Lawrence’s second straight winning Pitch speaks volumes about the importance of having innovative minds. 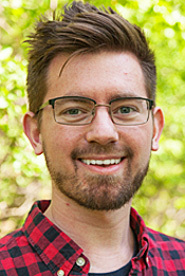 Dayne Rusch from UW-Oshkosh was awarded $17,000 in cash and in-kind support as the second-place finisher for “Pyxsee,” an app that allows parents to monitor or limit their children’s time on social media. Sam Hunt of UW-Green Bay was award third place and $10,000 in cash and in-kind support for PrecisionLAG, a device attached to the grip end of a golf club to help the golfer make proper contact with the ball. The Pitch competition features the best entrepreneurial ideas from college students in northeast Wisconsin, each of whom qualified through preliminary on-campus pitch competitions at their respective institutions. The winners were chosen by a panel of five judges representing Nicolet Bank, Gulfsteam Aerospace, gener8tor, a startup accelerator, Baker Tilly Virchow Krause and Winnebago Seed Fund. 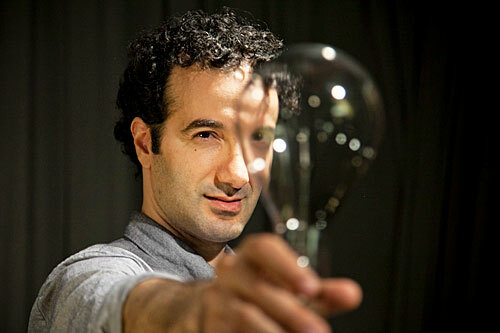 Jad Abumrad presents “Gut Churn” Thursday, Feb. 1 at 11:10 a.m. in the Lawrence Memorial Chapel. The address, the third in Lawrence’s 2017-18 convocation series, is free and open to the public. A question-and-answer session will immediately follow the address. In Abumrad’s world, “gut churn” is that radical uncertainty that is a key component of any creative process that pushes the envelope. He applied that philosophy in launching “Radiolab” on New York radio station WNYC in 2002. What began largely as a science program has evolved into an exploration of broader issues — sport, the death penalty, counter-terrorism and most recently the U.S. Supreme Court — examined from less conventional angles. The show, which combines cutting edge sound-design, cinematic storytelling and a personal approach to explaining complex topics, is nationally syndicated to more than 500 stations and its podcasts attract nearly two million listeners. Skeptical of today’s mainstream media, Abumrad prefers “journalism that forces you to experience what someone else is going through” to articles that focus on telling you whether what someone said is right or wrong. In 2016, Abumrad created a spinoff program he called “More Perfect” which is based on cases from the docket of the U.S. Supreme Court and how they affect people’s everyday lives. 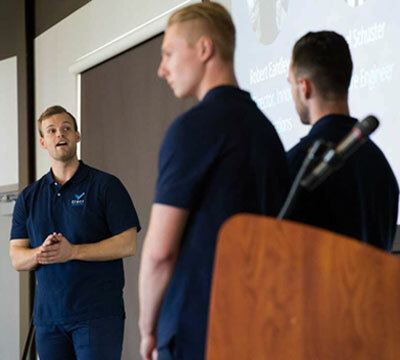 Four Lawrence University budding entrepreneurs will present their ideas for “the next great thing” Wednesday, May 3 at Timber Rattlers Fox Cities Stadium in front of a panel of judges and an audience of northeast Wisconsin business leaders. 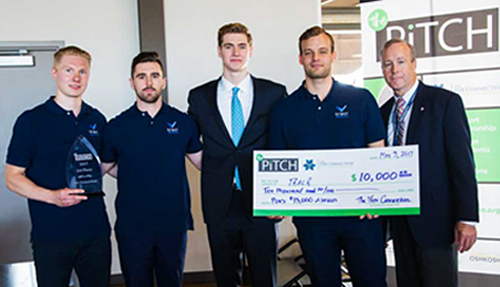 Sophomore George Mavrakis and seniors Mattias Soederqvist, Felix Henriksson and Ryan Eardley will compete for a total prize package worth $40,000 in cash and professional start-up services against students from St. Norbert College, UW-Green Bay and UW-Oshkosh in the first edition of The Pitch. The Lawrence students advanced to The Pitch — think “Shark Tank” for college students — after sharing first-place honors in Lawrence’s recent fourth annual LaunchLU competition. Gary Vaughan, coordinator of the Innovation and Entrepreneurship Program at Lawrence and lecturer of economics, said the idea behind The Pitch is to enhance entrepreneurial education and help retain young talent to the Fox Valley and northeast Wisconsin. George Mavrakis explains his aquarium sand-cleaning product C-Star at the 2017 LaunchLU competition. 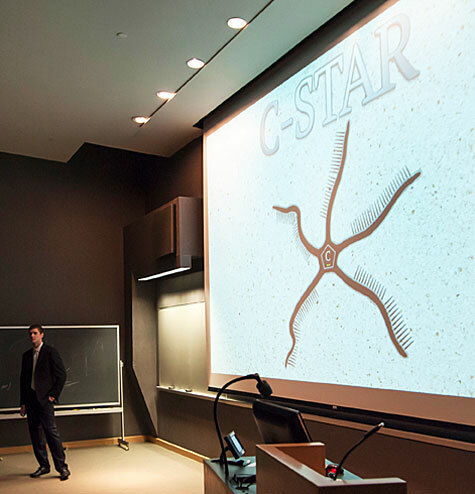 Mavrakis, who started his own business in sixth grade and won the 2016 LaunchLU contest, will present C-Star, a commercial product designed to eliminate one of the least favorite jobs of owning a fish tank: clean the sand in salt water aquariums. The starfish-shaped device stirs up sediment in the sand, providing food for coral while allowing the excess to be flushed through the filter system. The device can be programmed to operate at night while you’re sleeping so the tank is always clear when you’re awake. Mavrakis is working on a solar-powered prototype that would work off the aquarium’s own light. 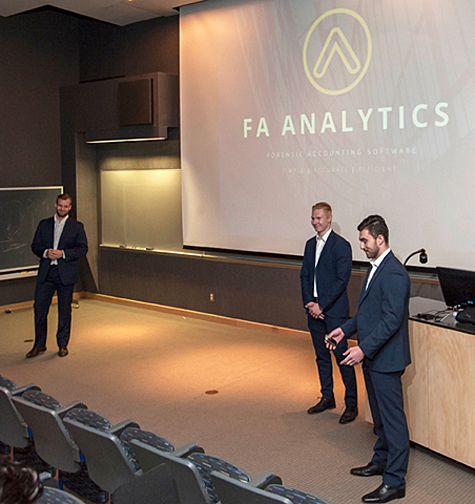 Soederqvist, Henriksson and Eardley, teammates on the Lawrence hockey team, will compete as team FA Analytics. They will pitch Tracr, a software application they developed for forensic asset analysis. The software automates the task of tracing assets acquired through fraudulent activities. The application was inspired by an internship Eardley had last summer at Deloitte, a national company that provides auditing, consulting, financial advisory, risk management, tax and related services. According to Vaughan, proof of concept for Tracr has passed a few people at Deloitte, who said they were on to something and would pay for it if they can operate it. “I feel like they have a decent chance of working this all the way through,” said Vaughan. Team FA Analystics — Mattias Soederqvist, Felix Henriksson and Ryan Eardley (l. to r.) — discuss their software application Tracr at the 2017 LaunchLU contest. The winner of The Pitch will receive $10,000 in cash and $15,000 in professional services (web design/development, product prototyping, marketing, legal advice, accounting support), while the second-place finisher will receive $5,000 in cash and $10,000 in technical services. Without making any predictions, Vaughan is confident Lawrence’s “pitchers” will represent the university well. • Maggie Brickerman, gener8tor. Managing director for gener8tor’s gBETA program, a free accelerator for early stage companies with ties to Wisconsin colleges or universities. 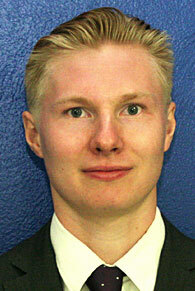 • Mike Daniels, Nicolet National Bank. President and CEO who co-founded Nicolet National Bank in 2000community lender. • Craig Dickman, Breakthrough Fuel. Founder, CEO and chief innovation officer for Breakthrough Fuel, which specializes in supply chain logistics and fuel cost management. • Greg Lynch, Michael Best. A partner with the national law firm Michael Best. Lynch advises companies on financing strategies and mergers & acquisitions. 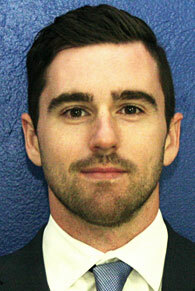 He is co-founder of the firm’s Venture Best emerging company practice. • Neil Mix, Quadrant. A silicon-valley style technologist, product developer and entrepreneur. A veteran of several venture capital funded startups, Mix co-founded a Microsoft acquisition and helped build Internet radio service Pandora from the ground up. 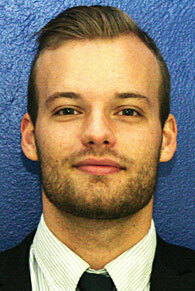 • Zack Pawlosky, Candeo Creative, owner of the nationally recognized entrepreneurial marketing agency based in Oshkosh. He also is the founder of a software development company and a partner in a venture capital firm. • David Trotter, Winnebago Seed Fund, managing director of Winnebago Capital Partners, the general partner of the Winnebago Seed Fund, a newly formed venture capital fund in Neenah. The fund focuses on seed investments in startup companies in the Fox Valley. The Pitch is organized by The Fox Connection, a collaboration of academic institutions in northeast Wisconsin to enhance entrepreneurial education and opportunity for area students. If Joe Bazydlo has his way, visitors trekking through any of the U.S. National Parks one day soon will have instant access to fascinating information about the park at their fingertips. Thanks to a smartphone app he helped develop — “Trailblazer” — hikers and other trail users will be able to magically add entries to their digital field journal via GPS technology. Each GPS point, or Trailblazer Beacon, once hiked through will unlock preloaded information about the hiker’s immediate environment provided by the people that know the most, the park’s rangers. “It’s sort of a scavenger hunt,” said Bazydlo, who has spent time as an interpretive ranger at Hawaii’s Haleakala National Park. 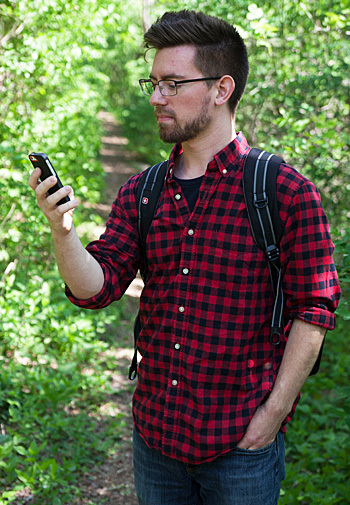 Hikers will find themselves on a park-wide scavenger hunt to pass through all Trailblazer Beacons in the park trails and complete all entries in their field journals. The app is designed to be interactive. With help from Eddie Elizondo and Alex Shabazi, Bazydlo developed “Trailblazer” in Lawrence University’s “In Pursuit of Innovation” course last fall and took the idea all the way to the finals of the 2015 Tiger Launch Competition at Princeton University. Bazydlo and Elizondo were among 20 finalists from an original pool of more than 250 teams from around the country that submitted 90-second video pitches for the first round of the competition when it began last November. 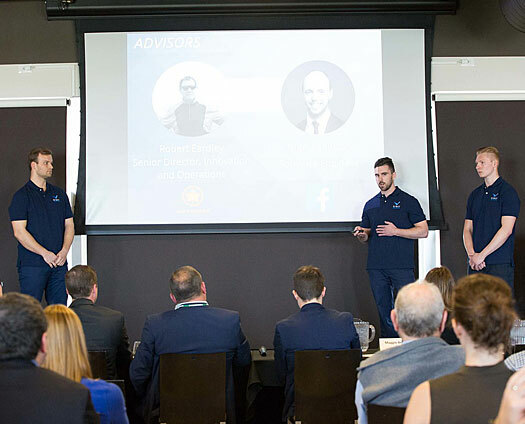 Bazydlo delivered the team’s four-minute presentation in front of three venture capitalists who served as the competition’s judges. 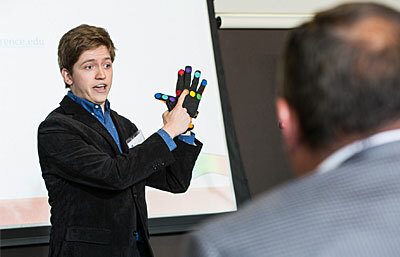 The annual competition is sponsored by Princeton’s Entrepreneurship Club. 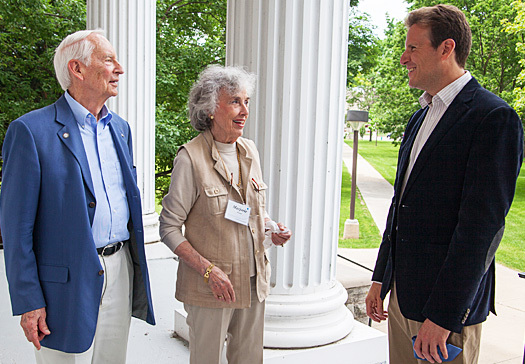 Lawrence was one of the only liberal arts college invited to the finals, which included teams from Princeton, Duke, Cal Tech, Clemson and Johns Hopkins universities, among others. The first- and second-place presenters as determined by the judges received funding awards of $10,000 and $5,000, respectively. Although he didn’t get any financial support for Trailblazer, Bazydlo felt the opportunity was priceless. Adam Galambos, associate professor of economics and one of the drivers behind Lawrence’s innovation and entrepreneurship program, expressed pride in the Trailblazer team’s success. The journey from Briggs Hall to the Princeton campus was a major triumph in itself considering the challenges the team encountered along the way, starting with the initial 90-second video pitch. Joe Bazydlo hopes his phone app will enhance users visits to the country’s national parks by providing additional information about their immediate environment. So “take two” was shot in Bazydlo’s living room back home in Ohio. The team lived in limbo for nearly three months before finding out on Valentine’s Day weekend they had made the second round. “Suddenly we realized we were running with the big dogs. 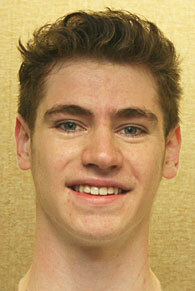 We had made the semifinals,” said Bazydlo. To earn a ticket to Princeton, the team had to survive a Skype interview, conducted by a business school professor from UC-Berkeley. With Elizondo in Chicago on an off-campus study program for the term, that required a three-way conversation. Despite their own poor self-assessment of the interview, to their complete surprise two weeks later they learned they made the top 20 and should start packing for a paid trip to Princeton. As for the next step for Trailblazer, Bazydlo says some additional tweaking is in the works.